Beverly Hills, CA—Lindsey Lohan has created the very public image of herself as a wild child. First of all she is very young and has had a life of privilege and excess that challenges her personal development. Looks, natural talent and a good agent brought Lohan as much trouble as her rewards because of a natural maturity issue. Yes, Lohan made her bed and apparently filled it with alcohol, drugs and energetic lesbians. It’s all part of a surreal existence that fuels needed publicity and keeps Lohan’s name out there. The fact is, any publicity is usually good publicity in Hollywood. Publicity does have a serious down side. Lohan can’t even pee in privacy. Lohan has not been served well by her own dysfunctional family, choice of friends or our government. Lohan is on the fast track to become another human life destroyed on the Boulevard of Broken Dreams. When but a few American citizens find themselves arrested for petty ante DUI and drug violations they are never put on display in garish live TV courtroom settings. If and when ordinary people slip they are punished in a substantially more dignified manner. A sick segment of our society wants to see Lohan or any celebrity suffer publicly for their misdeeds. These pathetic people need to get a life of their own. Lohan seems to have a problem that perhaps 30 or 60 days in a sound rehabilitation program may help. This is more about a massive effort at tyrannical government humiliation, than an effort to deal with a kid with what everyone agrees has an illness. Jail cells are for criminals who hurt others. Lohan has only victimized herself. In addition to Lohan’s woes the rent on her West Hollywood apartment and utilities must still be paid while she doing time and is in rehab with limited sources of income. Lohan may deserve some sanction, but instead she’s getting 100 times what she deserves through celebrity justice. Lohan will have massive career obstacles when this punishment is over. Resurrection will be very difficult but not impossible. Lohan should write a tell-all auto-biography while she is in the Gulag. I’m sure there’s a publisher or two around that will pay a decent advance for “Hollywood Rehab for Dummies” or “Life after Celebrity Justice”. I don’t want to see Lohan as another Courtney Love or a female version of Gary Bussey. I’d hope that book would be the last we her about Lohan’s, wild child days. I do want to see Lohan in good health and enjoying publicity for her ability as an actress and singer. If there is some saving grace is that 90 days in the financially strapped L.A. County Jail will actually get her less than three weeks in the slammer..
Will Lohan reclaim her life? We will have to wait and see. I think the court should put her in my custody. 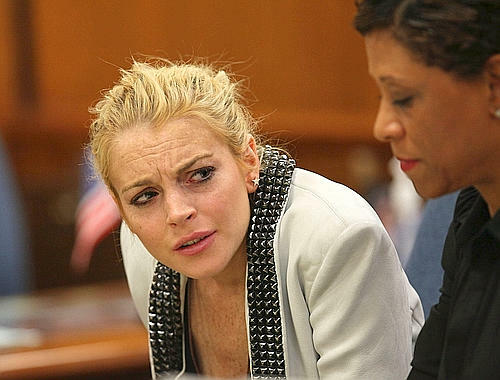 "OMG, can you believe that Lindsey Lohan got a DUI!" "I know, right? I'm telling you she really needs to pull her act together. What a terrible role model! Anyway, I'll talk to you later, I gotta run!" "Well, she's going to get the time she deserves to learn from this. See ya later! Where ya going?" "I gotta go post my daughter's bail. She was smoking weed while driving." "Ah, she's a good girl. She won't do it again." I miss the good ol' Parent Trap days. I do find it pretty said that a lot of people watch shows like The Hills, or the Kardashians, or whatever shows tell you what celebrities are up to. Instead of getting a life, they watch the lives of others. Now, Cops May Have to Scoot After they Shoot! Government, Why Control Entitlement Fraud? America’s Military Muslim Adventures Must End. Are we ready for President Joe Biden? Judge Threatens Blago and his lawyers! Mayor Daley Says No Guns For Negroes!